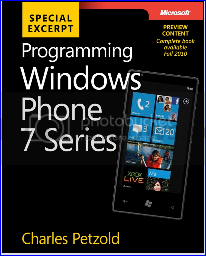 Download: Preview Content of Windows Phone 7 Series Programming ebook free. After the release of Windows Phone 7 Series now its turn to show some programming talent towards its application development. For the same Microsoft provided Windows Phone 7 Series Training Kit for download as free and now Charles Petzold MVP is gving away an ebook for the same so as to bring forward the talent and expertness of the developers in this field too. But yet now it is only available as in form of preview content and the complete book consisting of six chapters will be available as free download later this year. This book categorized as starting with Introductory part to Silverlilght upto XNA programming.